Home renovations are a popular task these days, with homeowners taking inspiration from a medley of home improvement shows to create dynamic outcomes that increase the property’s value and enjoyment. While interior design elements are beneficial, many Coloradans fail to consider the value of their outdoor decking. A deck installation is a major investment, but one that can provide years of quality enjoyment. Not only will a beautiful deck enhance the curb appeal of your home, it will also provide the perfect opportunity to create your own outdoor living space. Since 1992, our professional deck installers have worked to deliver amazing outcomes to residents in Fort Collins, Loveland, and the surrounding area. Rocky Mountain Fence & Decks is proud to operate one of the most successful decking companies in Larimer County, and our dedication to your project’s success helps to make us a top choice across the Front Range. We’re passionate about providing long-lasting quality for your home. 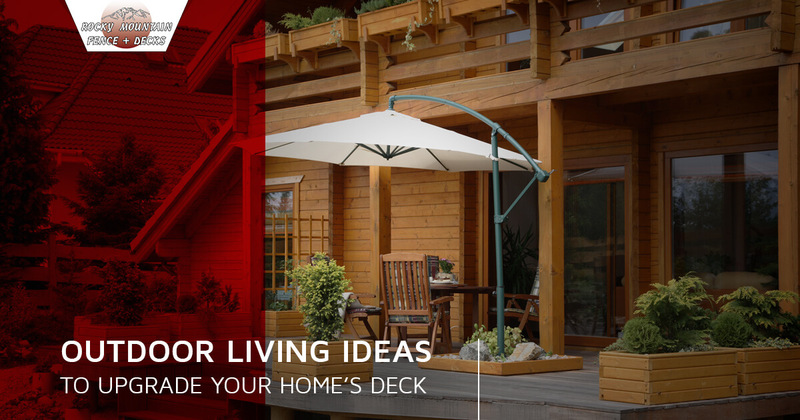 Today, our blog post will highlight a few easy projects that can enhance the quality of your home’s deck. If you’re in need of professional deck services, be sure to reach out to our team now! Vines, and assorted plantlife, can prove beneficial in creating a comfortable space for your Loveland home. Many outdoor living spaces rely on natural hanging elements to add beauty and shade. If your outdoor decking is looking a little bare, install some lattice underneath to create a vibrant canopy of vines and flowers. This coverage is ideal for homes with unfinished yards, storage beneath the deck, and so on. It’s important to find a species that is not invasive, so be sure to do your research when investing in hanging plants! One thing Colorado is known for is the sunshine. In fact, our area sees more days of sunshine than Miami or San Diego! What this means for homeowners looking to make the most out of their outdoor living space is to invest in comfortable furniture. Nothing spoils the enjoyment of your custom deck like flimsy, uncomfortable chairs. Outdoor couches, chairs, and other products can all be found to enhance the livability of any space subject to the elements. You can also work with local deck contractors to incorporate custom furniture that provides seating plus storage. Rocky Mountain Fence & Decks is here and ready to help turn your vision into a reality. Call today for a free quote! Our deck contractors are dedicated to creating an ideal outdoor living area for Larimer County residents. What this means for locals hoping to make the most out of their decks is the proper tools to ensure comfort in spite of Colorado’s unpredictable weather. Many homeowners invest in heaters, fireplaces, and other elements to give warmth when the temperatures start to drop. Loveland, Fort Collins, and other cities along the Front Range offer amazing views of the Rockies year-round, so why not take measures to make outdoor living more comfortable? Many homeowners incorporate windows, walls, and other temporary elements to help enclose their outdoor living space. Floor heating, mobile patio heaters, and removable registers can all help you to moderate the space to ensure the perfect conditions for any activity, from Thanksgiving dinner to a romantic Valentine’s Day evening. Homeowners looking for new outdoor decking or simply wish to update the look of their current system can implement vibrant color changes to make a major impact on the property’s aesthetics. Wood decks can be stained or painted, and composite materials come in a wide range of colors to help you create a bold contrast that enhances your home’s curb appeal. Complementing color schemes can strengthen the look of nearly any home along the Front Range. As always, our contractors are here and ready to assist! Rocky Mountain Fence & Decks is proud to be your trusted decking company for Larimer County projects since 1992. Our experienced fence and deck contractors specialize in paving and hardscape solutions for homes of all sizes. We’re dedicated to getting the job done right the first time. Contact us today to learn more and to receive an estimate for your project!